What a great weekend! Dr. Sketchys in Birmingham, helping my friend Naomi celebrate her wedding with a garden party and a flea market on Monday! Bought 12 more vintage cups and saucers for my pin cushions as well as an original WWII RAF suitcase. I have just booked our hotel in Colchester for the Escape to Victory event this coming Sunday. Please come along and show your support to the British Legion. This will be an amazing event for charity. So many of us are giving their time for free, so that more money can be raised. Dr. Sketchys went really well. I performed Songbird without the birdcage (it was either Richard or the cage and I had to go with Mr. Mew!). I did a tiny bit of drawing myself in between poses. I will post when I can and show you other people’s work too! Posted in Arts and Crafts, Home and Leisure and tagged burlesque, dr sketchys, pin cushions, pinup girls, pinups. Bookmark the permalink. Tomorrow I will be performing at Dr. Sketchy’s at the Victoria Pub, John Brighton St in Birmingham. Bring along your sketch pads and come along for a relaxed afternoon of Burlesque and life drawing! Doors open at 3.30pm. I will be performing my Songbird routine (minus the cage), singing live and posing for drawings. I will also be donning my mermaid outfit for a 2nd pose later on! Posted in Events and Performances and tagged burlesque, dr sketchies, dr sketchys, pinups. Bookmark the permalink. I would like to introduce you to Gracie Wheels. She is a 1979 Safari Caravan and my partner and I have been doing her up since February. As attendees will know; hotels and B&B’s are a huge expense when visiting such shows as War and Peace for the best part of a week, so Gracie will be our home away from home! She had been lovingly cared for by her previous owner, who was sorry to let her go. 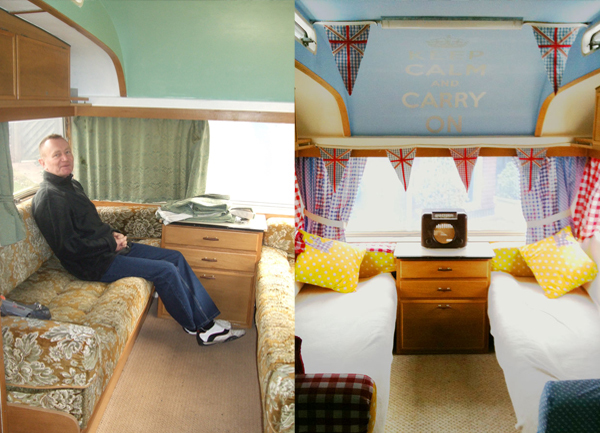 I had big plans for this vintage caravan from the beginning and had a patriotic, summery vintage theme in my head. Once my ideas board was complete we bought the paint colours and set to work! With a little help from some vintage reproduction accessories from Dotcomgiftshop and a selection of yummy fabrics we were off to a flying start! 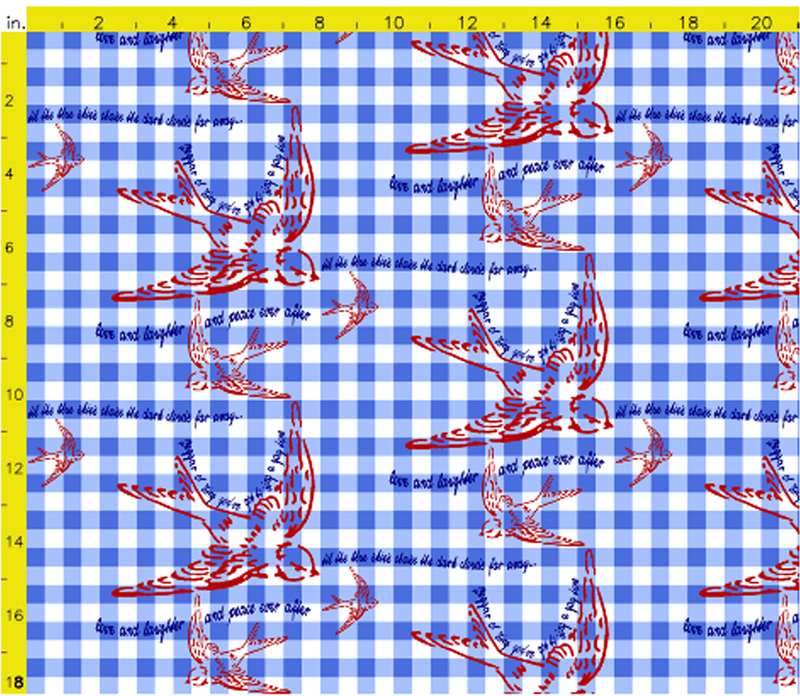 I even designed my very own fabric which you can buy here . We still have a way to go, but she has passed her service with only a few things to sort out (“Don’t turn on the gas heater or you may die of Carbon Monoxide poisoning, but other that that she is in good nick!”) and a slight damp problem which is usual for old caravans and some have already been sorted out. 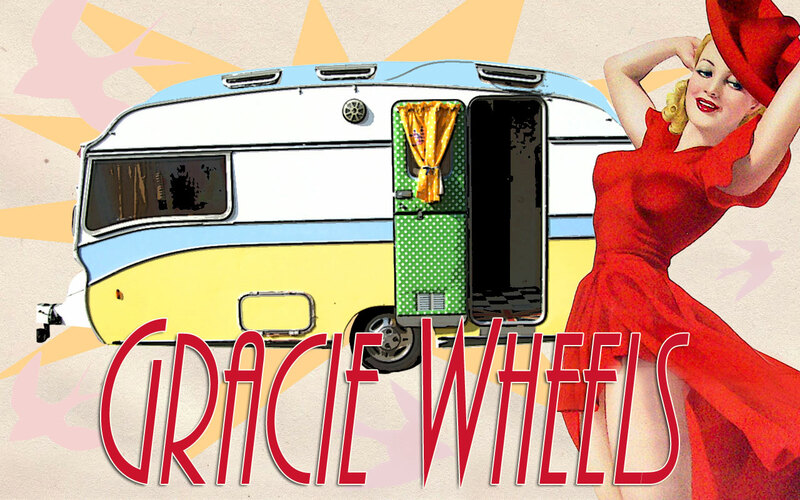 Gracie Wheels will make her debut at Wartime in the Vale in Evesham this June. We want a little test run that isn’t too far from home, just in case of any problems. I hope you enjoy her photos below! 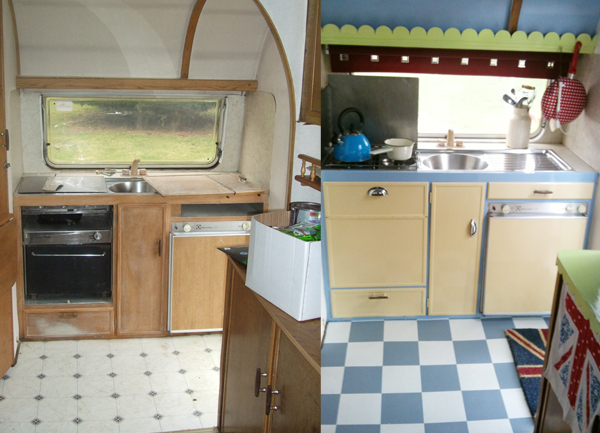 This shows a before and after of our Vintage Caravan. 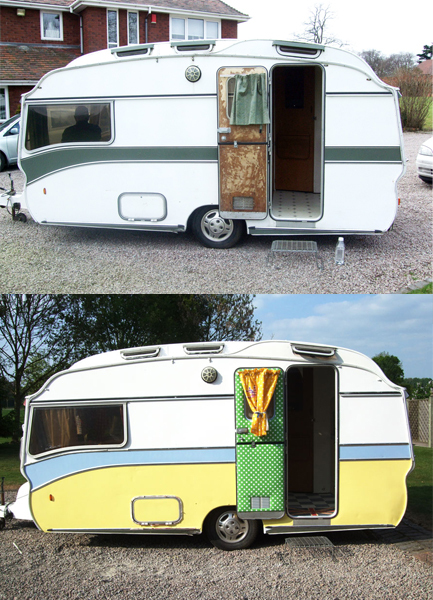 The only thing that has changed is the panel which has the lantern windows in, which is now pale blue. I wanted something jolly and something that seperated the kitchen and living space without walls. 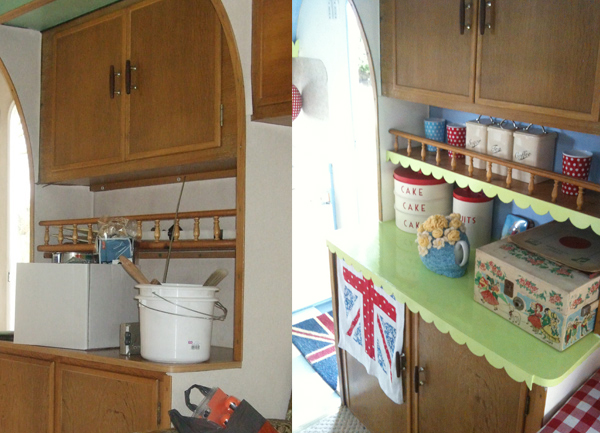 The yellow doors were in homage to my Grandad’s 1930’s kitchen, which my Grandma had painted a custard yellow! We got the great lino flooring from Carpet Right. The cooker and hob are gas and the fridge runs on gas and electric! We were so pleased with the outcome of the main living space! What a difference! I made the curtains, pillows and arm rests and the vintage bakelite radio houses an MP3 player with 1940’s radio shows and music on. Posted in Arts and Crafts, Fashion and Shopping, Home and Leisure and tagged 1940's, 1950's, caravans, gracie wheels, kitten von mew, retro, vintage caravan, vintage girls, vintage interiors, vintage pinup. Bookmark the permalink. I thought this would be a wonderful opportunity to post things that aren’t relevant on my main website. I will be posting things such as holidays, my hobbies and Gracie Wheels, my beloved caravan! You can also read about wedding plans and more! Posted in Day to Day and tagged hello, kitten von mew, new blogs, pinup, vintage pinups. Bookmark the permalink.